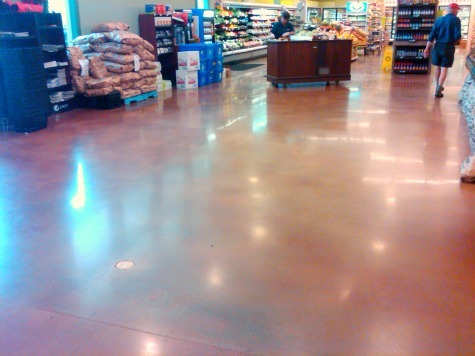 Polished concrete flooring is a being used in retail stores, dealerships, schools, commercial buildings and residential homes as an alternative to marble, granite, tile, wood, and linoleum. Polishing the concrete surface transforms your concrete floor into a beautiful, long lasting, very low maintenance floor that will have a smooth glass like finish. It's mirror like finish can actually appear wet or you can have a marble, matte, or semi gloss finish. The final finish actually feels soft to the touch and silky smooth. Concrete polishing allows for the restoration of older concrete slabs and the improvement of new concrete floors. Polished concrete can be colored using concrete stain and concrete dye, allowing for a very decorative appearance instead of just plain gray. By adding multiple colors to the surface a polished floor can be turned into a unique work of art. 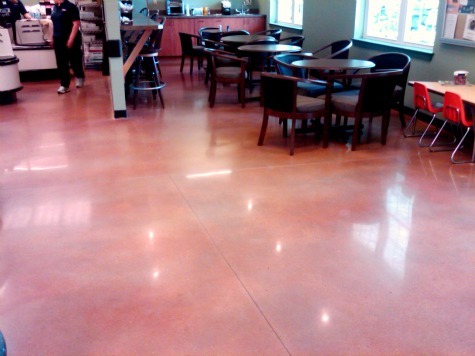 Most cement floors will respond well to the concrete polishing process. If your concrete surface in new, curing concrete usually takes 28 days, it is best to wait at least four weeks before beginning to polish. Some older floors might be too damaged to polish or may need cleaning and repairs before any polishing can be done.